We are back to boat building again. The trip to Cape Hatteras Island was interesting. Hurricane Isabel ravaged parts of the island. They have a new inlet that is reported to be 30-60' deep and cuts the isalnd in half. There are plans to use two barges to try and fill it in to get access to Hatteras Village. A lot of the markers in the Sound are missing. Considering that most of the sound is less than 3' deep makes the markers very important. They were only letting property owners on the Outer Banks the week we were there so there was not much pressure for a spot to fish. The dunes that keep the ocean out of the sound were breached in several places and some of the ocean homes had 3-4' of sand under them. Winter made a brief appearance last week and we are trying hard to get the cabin doors and windows installed to keep the heat in. We decided that we are not going to make it to the water until next Spring so we are taking our time and doing all the extra details that we were hoping to do if time allowed. The picture is of the cutout detail for the lock in the back door. 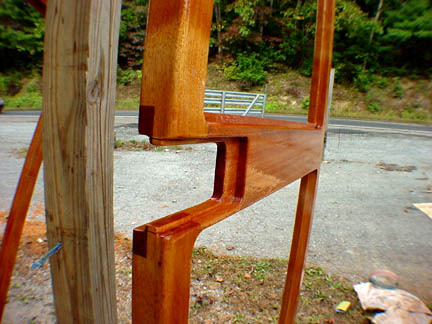 Some interesting joinery on this one. 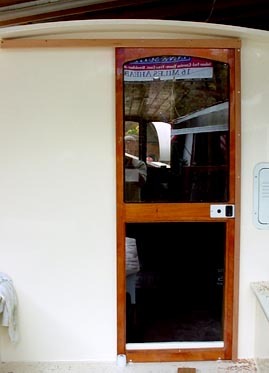 The doors and windows have 2 coats of epoxy and 2 coats of varnish to keep the water out. We decide to take advantage of a few days off that Debbie had from school and take a trip around the Chesapeke Bay. Soloman's Island, Annapolis, St. Michaels and then down to Norfolk/Portsmouth. And you wonder why it takes so long to build a boat! 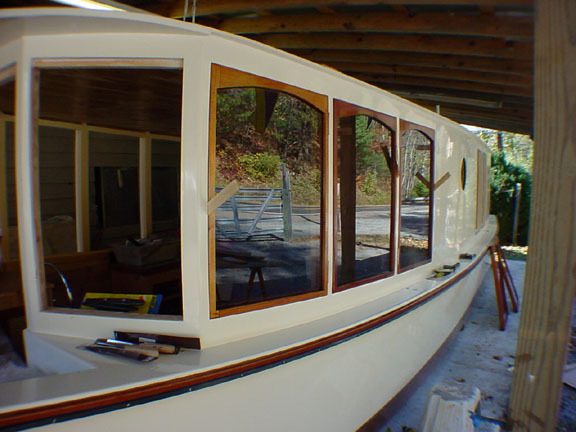 I talked with several wooden boat owners about varnish and they seem to like Epifanes the best but claim that Z-Spar is the eaisest to work with. I'm using Z-Spar and I'll let you know in a few years. The opinions about using epoxy under the varnish are that if you keep it coated well it lasts a long time but if not and the epoxy gets any cracks in it then it's a pain to get the hard epoxy sanded off to go back with new varnish. 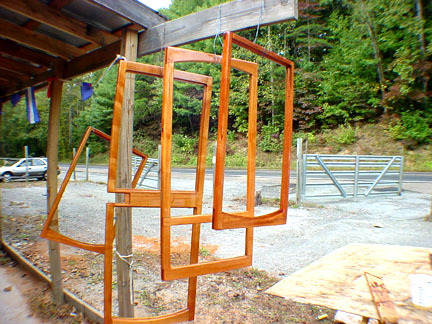 We've been busy getting the last two window frames cut out and epoxied together and today they get some varnish. 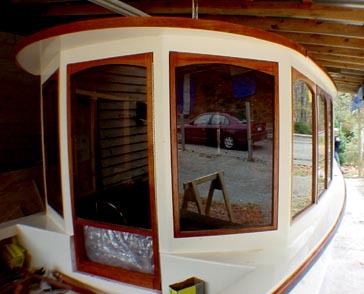 The doors and front windows are on their 4th coat and hopefully they will go to the glass shop at the end of the week. I glued up the Sampson Post last night and should get it sanded today. 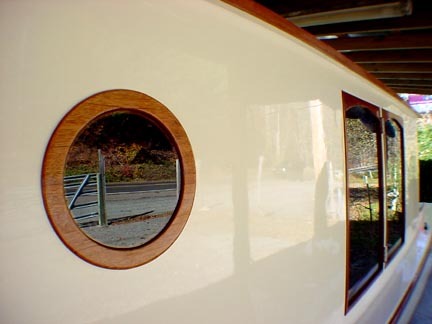 We are heading down to the Georgetown, South Carolina Wooden Boat Show this weekend to look at the boats and meet up with Mark Van Abbema, our designer. He is on his way back south after spending the summer in the Chesapeke Bay. I hope to get a chance to pick his brain about a lot of the details I have questions about. The show is on Saturday, 18th only from 11:00 to 6:00 and is free as far as I know. I'll be the guy walking around with the Mark V-39 t-shirt on. Just back from the wooden boat show and had a wonderful time. Had a chance to spend some time with Mark talking about his travels and boat stuff. The crowds loved his boat. I think he even sold a few sets of plans. 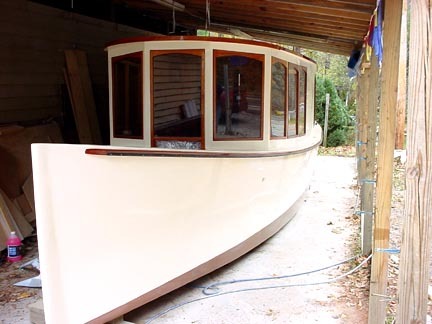 Maybe we can get a few more of these boats built and have a get together someday. Tom Lathrop was also there with his beautiful Blue Jacket design. Very well put together with wonderful wood everywhere. He and his wife were gracious enough to let me take a peek inside. Even Mark commented about the nice turn of speed with only a 50 hp Yamaha and four people aboard. There must have been several thousand people in attendance and the weather was perfect. Georgetown has really done a great job with their harbor walk and downtown since I was there 10 years ago. The Lexan for the windows came in and all have been cut and put in the frames with the port side windows installed today. The bronze tint adds a different character than I expected and should help keep out the summer heat. It looks darker than I thought it would but I'll need to see it in the bright sun to get a real feel for what it will look like on the water. Ather milestone!! We can actually lock up the boat now. That also means we can turn on the heater and work inside when it gets cold. All the windows and doors are installed and the front glass matches the Lexan perfectly. I still need to put the raised panels in the lower section of the front and back door. It's suprising how quiet it is with all the windows closed. The trim strip on the edge of the roof was installed and we will have a drain to catch the rain water off the top of the cabin if we want to fill the water tank for the head. We will also have a drain sewn into the canvas top that will cover the back deck later on. A lot of cruising boats collect rain water to use, especially in the Bahamas where water is very expensive(fifty cents per gallon). The house that we rented in the Abacos worked that way and the water was fine. A few more touches on the outside and then it's time to get the inside finished. (The need to collect rain water proved unnecessary. 105 gallons in the tanks lasts a long time). Not much work done on the boat this week. The anchor well and forward hold covers had the epoxy and xynole fabic put on. We made a trip to West Marine to buy a thinner strap hinge for the panel in the front door that will allow it to swing open for ventilation. Winterized the plumbing system as it was expected to freeze over the weekend. Worked on getting the desk area framed out and the pine for the frame up this weekend. It looks like I'll need to make 10 doors to finish things up. I figured out that it's eaiser to cut a frame out of Luan and then glue the pine to it. All the doors except the head and shower will have canning in them to allow for ventilation. The desk top will have the same hunter green laminate as the galley table. 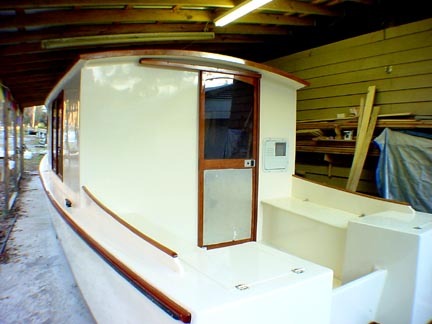 We took advantge of more record breaking high temps for this time of year and put on a few of the cleets, thru hull fittings for the bilge pump(for the unthinkable) and fuel tank fill and vent fittings. Some days are just so nice that you wake up and feel like today is a good day to put holes in the hull.........the truth is that I have been avoiding this step because I hate to work with the 3M 4200 sealing compound. That stuff has got to be the messiest stuff on the planet. I also finally got around to putting in the rest of the window sill frames on the inside. Debbie wants me to put up more pictures but I'm afraid that I now have a bigger mess in the boat than I started with so no picture this week. Sorry Deb! We head to Pittsburgh and then up to Canada for the holidays so I don't expect much to be done for a few weeks. I hope everyone gets enough Turkey!! Trim on the back deck. Back door still lacking bottom panel.